Nishi Pearls has launched a ‘Second Chance Bracelet’ in time for the holiday season. All proceeds from sales of this bracelet will be put toward gemmology training for female newcomers to Canada. Nishi Pearls has introduced a glowing way to give back this holiday season. 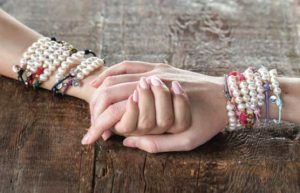 With the launch of its Second Chance Bracelet, the company is embarking on an initiative to support the skill development of female newcomers to Canada. Stackable and handcrafted, the bracelet features numerous colour and metal accent options as well as—of course—cultured freshwater pearls. All proceeds from Second Chance Bracelet sales will be used to fund gemmology training for women new to Canada, enabling them to evaluate, grade, and sell gems. Indeed, according to the 2016 Annual Report to Parliament on Immigration, improving skills and finding employment are top priorities for female refugees, who comprised 49 per cent of all refugee claimants that year. By introducing women to the gems and jewellery industry, Nishi and its partners Fondation Y des Femmes, YWCA Montréal, and the Montréal School of Gemmology (EGM) are helping meet those priorities. The team has set an initial fundraising goal of $20,000. In a recent appearance on Breakfast Television Montréal, Alique Akkelian and Isabelle Lajeunesse (executive director of Fondation Y des Femmes) announced half that target has already been reached. Hopes are high the full objective will be met by the end of the year. More information on the bracelets and an option to donate to the cause are available online. Copyright ©2019 Jewellery Business unless otherwise noted.